Ever since Instagram introduced video functionality I’ve been focussing my energy on how to showcase an engaging and authentic travel experience in 15 seconds or less. 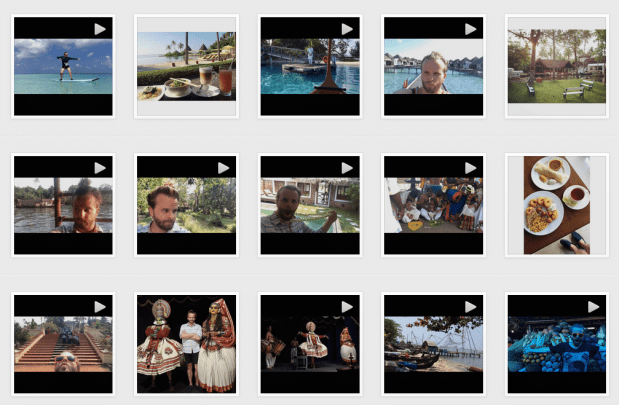 Over the past two years I’ve tinkered with over ten video apps while tip toeing from Bora Bora to Bermuda, splashing through Curacao to Croatia. My @dobbernation Instagram is now regularly filled with these videos which I typically shoot, edit and share moments after leaving the museum, spa or theatre. Apple’s new iPhone 6 offers a slick design and plethora of tech specs which make shooting, editing and sharing your travel experiences instantaneously as easy as 1, 2 3. Exposure control at your fingertips! Lighten or darken a photo or video in the preview pane with a simple slide, up to four f-stops in either direction. When you’re shooting HD video on iPhone 6, you have the option of recording 1080p at 60 fps. These faster frame rates capture more action each second to create sharper images for smoother, more true-to-life video. iPhone now includes continuous autofocus in video — an advanced optical feature that uses new Focus Pixels to ensure that your shot stays sharp while you’re filming, even if you or your subjects are on the move. And faster autofocus means you experience fewer inadvertent focus changes, dramatically improving the quality of your video. Slow down life’s fastest moments. The slo-mo feature on iPhone 6 lets you shoot HD video at either 120 fps or 240 fps in 720p. You can even record and then select the portion you want to slow down, or change which section of your film is in slow motion at any time. Cinematic video stabilization helps to keep your shots steady. So even if you’re doing something like filming while hanging off the side of a street car, your video looks as smooth as if you were gliding through the scene on a rig. With a larger aperture and all-new sensor technology, the front-facing FaceTime HD camera now captures 81 percent more light. It also has improved face detection for whenever you’re trying to snap the perfect video selfie. 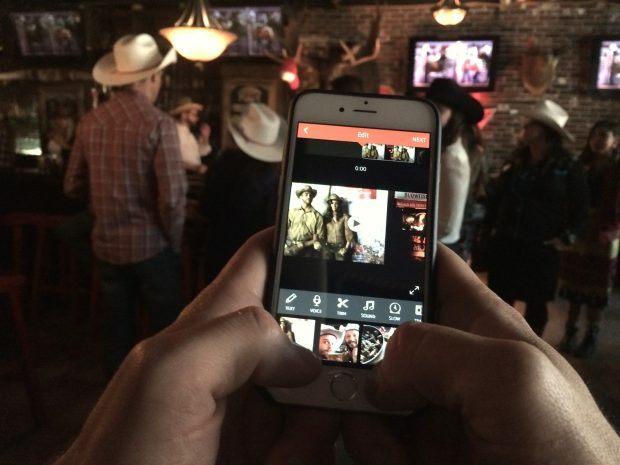 Instagram allows you to capture 15 seconds of footage. I typically try and film 10-15 individual videos so I can edit them down in the Videoshop App later. Be sure to film your video in landscape mode. Once you’ve finished shooting import all of your videos into the app from your camera roll. Organize them onto your timeline based on how you want to share your experience. You can use the voiceover functionality to add narrative to your story. Use the trim tool to cut up your video to the exact proportions you want to share. I suggest 1-2 seconds maximum per clip. The slow tool allows you to speed up a clip (I’m riding that mechanical bull at 2X speed). You can also slow down clips to suit your needs, ideal for if you are diving into a pool or throwing a pie in my face. Click on the display tool and you can increase the brightness (ideal for video shot in dimly lit restaurants or bars) as well as switch up the hue, contrast, saturation, vibrance and shadows for each individual clip. Once the timeline is to your liking click on the Sound Tool to import any song from iTunes. It’s important to pair the song with your video so it enhances the experience. Use a folky ballad if you’re horseback riding, pop song if you’re at a contemporary art gallery or high energy electric track if you’re doing something active and adventurous like zip-lining through the jungle. Your video is now complete and ready to share instantly on Instagram, Vine, Snapchat, Facebook, Youtube or Vimeo. Here are a few examples of some of my most recent travel videos. The overall experience is perfected by using a mix of still video, movement, interesting vantage points, selfies (people want to see who’s behind that camera) and perfectly paired background music. I shot the video up top on my recent trip to Scottsdale Arizona. The Buffalo Chip Saloon is ranked as one of America’s most authentic cowboy bars and offered plenty of playful action which included outdoor rodeo, bonfire, tequila spiked margarita’s, tableside S’mores station and live band with plenty of cowboy hats on the dance floor. Telus offers a great plan for tech-savvy Canadians traveling to the US who want to avoid limiting their phone usage to WIFI while on the road. In Arizona I was easily able to share my video’s instantaneously via Instagram, Twitter and Facebook via the networks US Combo Travel Pass 80. If you’re out of the country and keen to share your experiences in the moment be sure to research the plan that best suits your need so you can share your special moments with family and friends without returning home to a jaw dropping bill. That roaming can ruin you! In less than 15 seconds adventure through the Four Seasons Resort Kuda Huraa’s stunning spa. The journey begins with a 30 second boat cruise to a private island where smiling therapist stands at the dock ready to greet you. Wander through palm covered island, sip on refreshing tea and indulge in moody massage while staring at fish swimming under your overwater-bungalow via the floors sparkling glass windows. I captured the energy of India’s famed Holi Festival in Agra at a beautiful park just a stones throw from the Taj Mahal. Holi is India’s favourite annual street party featuring water balloon fights, multicoloured pigment parades and electric Bollywood beats. It’s amazing how watching a quick 15 second clip can transport you half way across the world! Fantastic article! So informative…..I can’t wait to upgrade my iPhone 4 to a iPhone 6Plus in the Fall 2015 when Apple likely comes out with yet another new iPhone model to beat the 6 Plus.